Manfred Baumann is a loner. Socially awkward and perpetually ill at ease, he spends his evenings quietly drinking and surreptitiously observing Adele Bedeau, the sullen but alluring waitress at a drab bistro in the unremarkable small French town of Saint-Louis. But one day, she simply vanishes into thin air. When Georges Gorski, a detective haunted by his failure to solve one of his first murder cases, is called in to investigate the girl's disappearance, Manfred's repressed world is shaken to its core and he is forced to confront the dark secrets of his past. 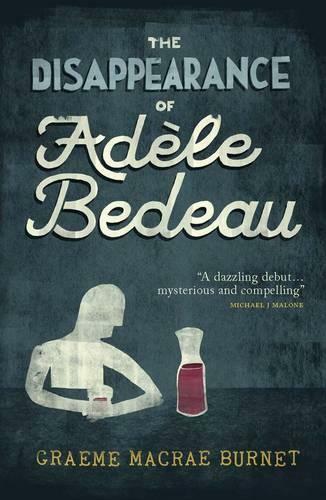 The Disappearance of Adele Bedeau is a literary mystery novel that is, at heart, an engrossing psychological portrayal of an outsider pushed to the limit by his own feverish imagination. Featured in The List's Top Scottish Books of 2014. 'A character driven plot that is incredibly engaging. Rural France provides an alluring setting, while the writing is evocative and the characters intriguing. The Disappearance of Adele Bedeau is a great read.' - We Love This Book. 'A strikingly singular talent, Burnet blends a gripping story with compelling characters and surprising sweeps of the imagination. This is an accomplished, elegantly written and exciting first novel.' - Will Mackie, Booktrust. 'Burnet has completely nailed the tone, colour and sly wit - beautifully and convincingly drawn.' - Michael J Malone.